In the photo, nails can be seen protruding through the roof from the inside outwards. The homeowner had told me about water leakage in the bathroom ceiling below. This is brand new construction in Oakville, completed in 2018. The nails were installed during construction to mark the location of a vent terminal for the bathroom fan. What’s missing is the vent terminal! The vent terminal needs to be installed, and that requires cutting a hole in the roof and connecting the terminal to the hose that (we hope!) is inside the attic. What’s missing is a vent terminal like the one in the forefront of this photo at the same house. Also visible are two plumbing vent stacks, a terminal at the far end, and two roof vents close to the ridge. Checking for missing vent terminals is a regular part of my inspection process. That includes vents from all storeys of the house. I have found missing bathroom ,drier, and kitchen exhaust terminals on houses over 10 years old. 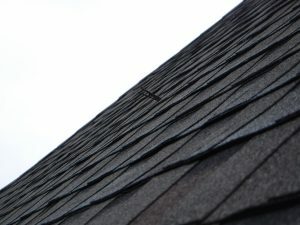 This type of defect is not easy to find as it is hidden on the roof, out of view from ground level, and even difficult to reach by ladder. The narrow space between houses in new developments often hinders ladder placement. 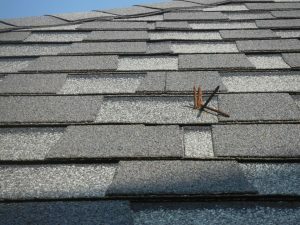 The homeowner now must pursue the builder through the Tarion warranty program to get this made right. The challenge with any work done in hidden locations is verifying that the remedial work is correct. 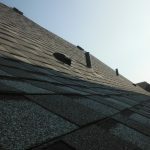 The homeowner should ask the workers to take photos or provide some other verification of work done.